It’s summertime, which means it’s grilling time. But before you fire up your grill, especially if it’s been sitting out all winter, it’s a good idea that you take a moment to check that everything is in proper working order. It’s easy to forget, but by taking a few measures now, you’ll not only maintain your initial investment and extend the life of your grill, but you won’t be caught blind-sided. There’s nothing more frustrating than stepping outside to prepare a barbecue dinner, only to find out your grill won’t start or there’s some other problem you could have addressed ahead of time. Here are a few tips for getting your grill summer-ready, including what to look for to help you if you run into a problem. However, we do recommend that if you do uncover a problem, contact your service provider before trying to repair anything yourself. By involving a professional in the actual repair, you can rest assured that the right parts are obtained and your initial investment is retained. Check the flame strength. Things to look for might be temperature and flame height. If you notice a weak blue flame or even a yellow flame, that indicates your gas grill is not outputting enough flame and it’s not getting as hot as it used to. The cause of this could be a damaged component, obstruction, or poor connection. Uneven heating? Inspect your grill’s burners. Chances are, one of your burners are blocked. It’s not uncommon for fat drippings to clog the burner ports and block the gas. You can try cleaning the area with a wire brush. Or you might be a problem with your burner. Look for any rust. Rusting and corroding usually means moisture is getting inside when it’s not being used. You can protect your grill by using a waterproof cover and cleaning it every three months. Too much rust will prevent the burner and grates from delivering the heat you need. You might be able to remove light rusting buildup with sandpaper and degreasing spray. But you’ll probably have to contact your service provider to replace grill accessories. Your service provider will be knowledgable about your grill manufacturer and obtain the parts you need. Check your fuel line for leaks. To do this, you’ll need a solution of dish soap and water and a brush. Coat the entire fuel line including the connections with soapy water. Then turn the knob to release the air. If bubbles start forming, there’s a leak. It may be your regulator or tank. Turn off the gas. Your service provider may need to replace fittings or replace the hose if the leak occurred along the line. Not heating up? Making a loud whistling sound? Check your fuel gauge. An easy way to check if you don’t have a gauge, is to pour some warm water over the side of the tank and then slide your hand down the side of the tank. Your propane level is where the temperature changes from warm to cold. If you have enough fuel and there’s no leaks, this problem might be caused by damaged parts. 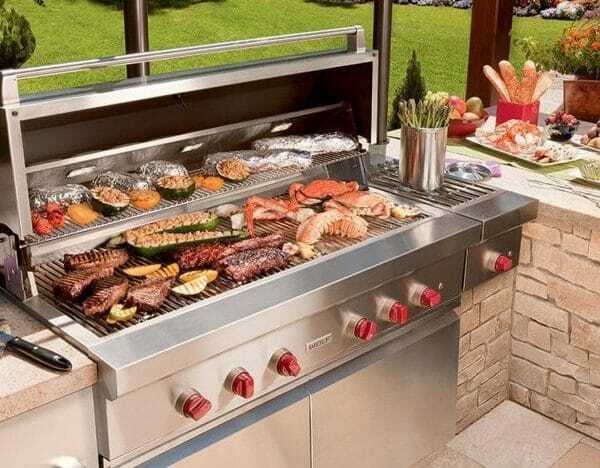 Your service provider can select and install the appropriate gas grill accessories. Because not all parts fit every model, finding the right parts is critical. Check your regulator, especially if you still hear the whistling sound. Make sure it’s attached tightly to the tank and that the valve is turned on. If the regulator is shaking and causing the sound, then this is probably the root of your problem. Your service provider will need to replace your regulator. If your grill won’t light, and all of the above steps check out, try manually lighting your grill. Use a grill lighter and keep your hand a safe distance away from the burner. If it lights, the ignitor may be the problem. If it’s an electronic lighter, check the batteries following your owners manual. If that doesn’t work, check the electrodes. They can get dirty and may need to be cleaned with some alcohol. Or they may not be aligned clearly. Again, your service provider can help you here.